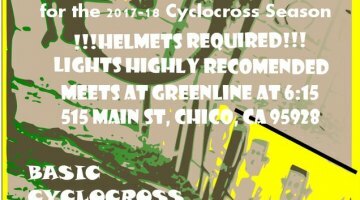 Changing skies and a long course at Coyote Point in San Mateo, California, welcomed racers to the fifth and final race of the Bay Area Super Prestige Series. Although promoter Tom Simpson’s declaration that the series would not continue in 2011 was still on everyone’s mind, and many of the top racers had left California for a week of racing in Portland and Bend, a sizable crowd came out to cheer and compete. Not only were series champion jerseys on the line, but the side series – the team competition – was going to conclude with a brew-off, each team having been invited to submit one handcrafted beer for the judge’s enjoyment and consideration. Early sprinkles and periods of sun and wind had created a course that was well-compacted and rode fast. Damp pavement, however, made the lengthy blacktop sections treacherous, particularly where the many wood chip and gravel covered dirt segments began or ended. Every category saw a handful of riders lose their traction on paved corners, and this meant that vigilance was going to be part of the race. The course began on a paved segment leading uphill through a paved chicane that then plunged down through the eucalyptus groves towards the San Francisco Bay through rutted and root-strewn single track to a beach sand 180 that forced all but the most skilled racers to dismount and run. The course used the entirety of the park, making it an extra long lap with plenty of power sections, leaving riders gassed and making the aforementioned vigilance that much harder. Although every race had gone on during periods of showers and clearings, the B men had it hard as the skies opened up and turned what many had experienced as a tacky dirt course into an absolute mud bath for the final category. The A level racing kicked off with a bang when the event staff used a small canon to signal the start of the master men’s race. Through the first two laps, a tight group led at the front of the 35+ pack with Cal Giant Strawberrie’s two-time national Master’s champion Todd Hoefer setting the pace. Van Dessel’s Tao Bernardi matched him pedal stroke for pedal stroke until the Cal Giant team made its attack. Hoefer opened a gap and was joined by teammates James Coats and Steve Reaney until, with one to go, Hoefer widened the gap to 20 seconds and soloed in for the win. The 45+ race was a battle from start to finish with Cal Giant’s Gannon Myall duking it out with Team Reambuski Law’s Kevin Merrigan. In the end, Myall took the win with a narrow lead. 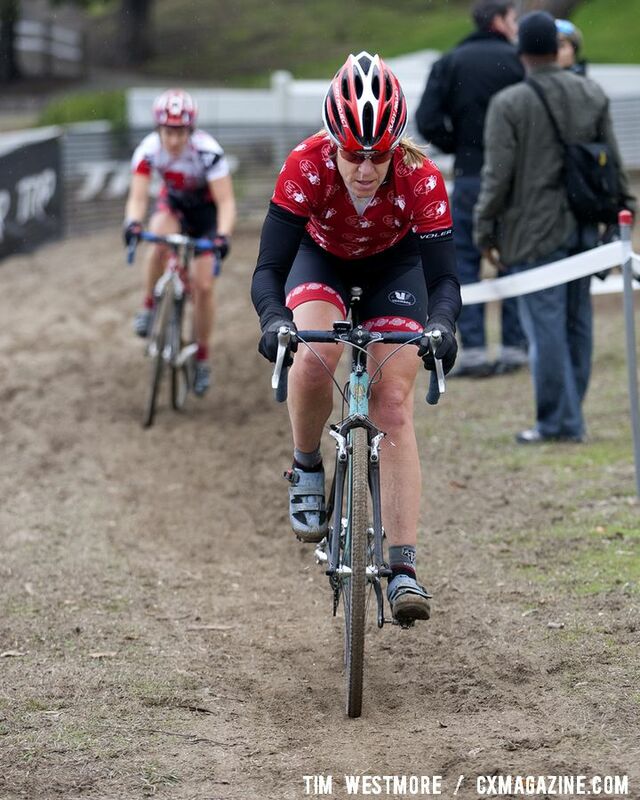 The story in Bay Area women’s cyclocross this season can’t be written without the name Kerry Barnholt. 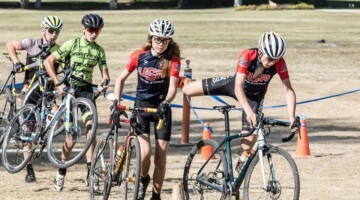 Coming into this week’s race, Team Scott-Ritchey’s Barnholt had won three of the four races in the Bay Area Super Prestige series, losing only one in a very close finish to Bike Station Aptos’ Devon Haskell. 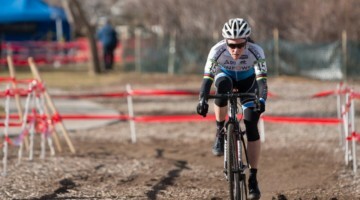 The rest of the day’s women’s field didn’t let this fact discourage them and brought their race legs to Coyote Point, determined not to let Barnholt walk away with the win. After the first lap, a tight gruppetto had formed at the front of the race with Cal Giant Strawberry’s Gina Hall leading Barnholt and Team Rambuski Law’s Karen Brems off the pavement and onto the dirt with each woman holding her position tightly. Lap two around the long course saw Barnholt leading Brems, with Hall keeping both in sight. 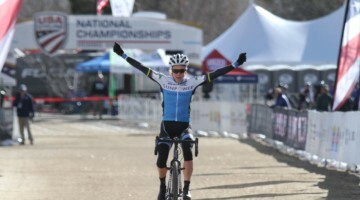 By the final lap, Hall had come back to the front and challenged Barnholt to a thrilling sprint that left race announcer Bruce Hildebrand shouting as Hall crossed the line first to take her first BASP win of 2010, with just enough of a margin to raise her fist quickly in victory. After the race, Barnholt shared a little bit about the course and reflected on her race. “The pavement was really slippery; I guess you could say I was being careful out there.” When asked about Hall’s win, Barnholt offered graciously, “Gina had a great race, she’s really coming into some form.” All three women on the podium will need that form next week as Hall and Barnholt travel to Oregon to defend separate master’s titles and Brems looks to add another win to her impressive list of domestic and international palmarès. Kristin Drumm of Team Divine Electric took the master women’s race, and with it the series jersey. 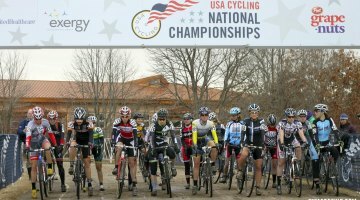 With the USGP races in Portland this weekend, many of the usual suspects in the men’s Elite race packed up and headed north to combine USGP and Nationals in one long, cold road trip. Those who remained in the Bay Area were not going to take it easy on themselves or the competition. Cal Giant’s Steve Reaney, for example, came into this race leading both the 35+ and Elite men’s categories and didn’t have plans to give series points away for free. A deep call-up, a canon blast and the final A race of BASP 2010 was underway. Family Cycling Center’s Aaron Bradford took an early lead and pushed the pace for two laps, looking very determined. Calamity struck and Bradford crashed hard, leaving some skin and his hopes of a win on the course as he made an early exit from the race. 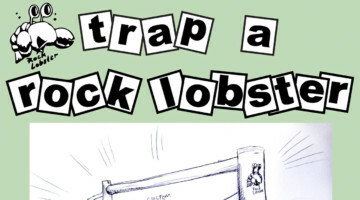 At that point, Reaney and Bay 101/HRS/Rock Lobster’s David Wyandt challenged each other to a duel. Wyandt, it should be noted, was number two in the series leading up to this race. Reaney worked with Wyandt for the rest of the race, as Hildebrand said, “doing what he had to do” to clinch his series win. But in the end, it was Wyandt first across the line and Reaney, having done the math and knowing that second was more than enough, close behind. On a day that felt more like the last day of class before holiday break than a series finale, the smiles couldn’t be wiped off the faces, even by the pouring rain that closed out the race. Even the Elite men, for whom the rain was so hard that the podium ceremony had to be held under a canopy, were all smiles receiving their medals and Sheila Moon brand swag. As the Bay Area cyclocross season gets sorted out for 2011 and the future of the Bay Area Super Prestige and its courses remains a question mark, just about everyone is going to hope for at least one more chance at victory on the grounds of Coyote Point next year.